As a result of an order issued by the U.S. District Court for the District of Hawaii last night, foreign nationals from Iran, Libya, Somalia, Sudan, Syria and Yemen are now considered exempt from President Trump’s travel ban if they are coming to the U.S. to visit with grandparents, grandchildren, brothers-in-law, sisters-in-law, aunts, uncles, nieces, nephews and cousins. 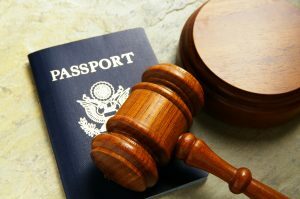 In addition, the court held that the travel ban cannot be enforced against refugees from the six countries who have formal assurance from a resettlement agency in the U.S. for placement. The District of Hawaii’s order greatly expands the number of people who are exempt from the travel ban which, as we reported earlier, was partially reinstated by the U.S. Supreme Court in a per curiam decision issued at the close of its term late last month. Previously, under the Supreme Court’s decision and implementing FAQs issued by the U.S. Departments of Homeland Security and State, foreign nationals from the six banned countries could only travel to the U.S. to visit with parents, spouses, siblings, fiancés, children, sons-in-law and daughters-in-law. We will continue to report on any additional developments as they unfold. the foreign national does not have a valid visa on March 16, 2017.
directs the Secretary of Homeland Security to suspend decisions on applications for individuals seeking refugee status for 120 days (beginning on March 16, 2017). the collection and disclosure of certain data to the American people pertaining to foreign nationals and their involvement in or connection to certain nefarious activities (i.e., terrorist-related offenses, acts of gender-based violence against women, etc.). Despite the Trump Administration’s efforts to narrowly tailor this newest EO, we anticipate that there will be legal challenges filed by various stakeholders in the coming days and weeks.